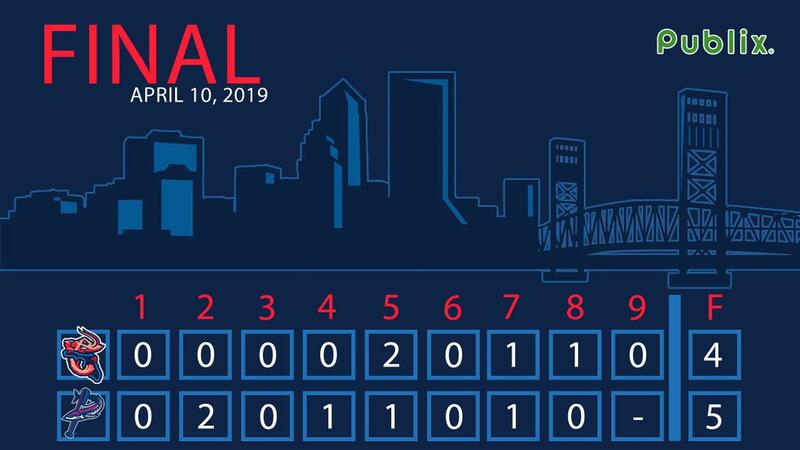 PENSACOLA, Fla. - The Jacksonville Jumbo Shrimp (3-3) fell to the Pensacola Blue Wahoos (4-2) by a 5-4 score in the first game of the five-game series at Blue Wahoos Stadium on Wednesday night. Pensacola right-handed starting pitcher Jorge Alcala (2-0) earned the victory, pitching five innings where he allowed two runs on five hits with no walks and four strikeouts. Jacksonville left-handed starting pitcher McKenzie Mills (0-1) took the loss, allowing four runs on seven hits with a walk and three strikeouts in his 2019 debut. Pensacola relief pitcher Ryan Mason earned his first save of the year by recording the game's final five outs. The Blue Wahoos started the scoring in the bottom of the second, as Drew Maggi led off the inning with a solo home run to left field. Pensacola made it a 2-0 lead two batters later with an RBI double by Jimmy Kerrigan. Former Jacksonville third baseman Brian Schales led off the bottom of the fourth with a solo homer to left to grow Pensacola's lead to 3-0. The Jumbo Shrimp struck back with a pair of runs in the top of the fifth. After Rodrigo Vigil brought in the first run with an RBI groundout to second, Anfernee Seymour added an RBI single to make it a 3-2 lead. The Wahoos got a run back quickly, as Jaylin Davis led off the bottom of the fifth with a solo homer to put the Pensacola lead at 4-2. Jacksonville loaded the bases in the top of the seventh and Vigil was hit by a pitch to cut the lead to 4-3. However Pensacola reliever Jeff Ames struck out the next two batters to strand the bases loaded to maintain the Wahoos lead. Schales added to his night with an RBI double in the bottom of the seventh to make it a 5-3 lead. Jacksonville got a run back in the top of the eighth when Brian Miller added an RBI groundout to cut the Pensacola lead to 5-4. With two outs in the inning, Bryson Brigman singled to left field, but Justin Twine was thrown out at home by left fielder Ernie De La Trinidad to end the inning, maintaining the Wahoos advantage at 5-4, which would be the final. Jacksonville right-hander Dustin Beggs worked the final three innings out of the bullpen, allowing a run on five hits with no walks and three strikeouts. Typically in Jacksonville's starting rotation, Beggs worked today to build up his pitch count after his Saturday start was suspended due to rain in the top of the first inning. The Jumbo Shrimp and Blue Wahoos will continue their series with the second game of the five-game set on Thursday night at 7:35 p.m. eastern. Right-handed pitcher Robert Dugger (0-1, 9.00 ERA) will start for Jacksonville against Pensacola right-handed pitcher Brusdar Graterol (0-0, 1.93 ERA). Fans can listen to the games on the Jumbo Shrimp Network presented by Community First, beginning at 7:20 p.m. with the pregame show "Shrimp On Deck" locally on Sunny 102.3 FM, on the TuneIn Radio app, and www.jaxshrimp.com.